The unfading pride of Jaipuris in their rich culture tastefully reflects in their culinary delights. My trip to Jaipur, a city occupying a significant place on the itineraries of tourists from across the world, was a great delight. Being a foodie I was quite euphoric about trying out various specialties of this Pink city. I really wonder how these people add such a great flavor to the dishes by using just the most basic of ingredients. No wonder cuisine has always been a serious business in Rajasthan since the era of Raja-Maharajas. The mere mention of dal-bati-churma makes my mouth water as this is one of the Rajasthani dishes which tops my menu. I was seated in a restaurant which was decorated in a traditional style, which added more charm to my dining experience there. Before placing the order for dal-bati churma I flipped through the pages of the menu which featured names of the tempting dishes such as Biryani Rumi, Lal Maas, Safed Maas, Kesaryia Bhaat and the list seemed endless. I also relished a big glass of butter milk(lassi) and I was completely full. But I had heard that one must not miss the sweet dishes of this royal state. So how could I leave the restaurant without rounding off my hearty meal by a sweet dish. I ordered Ghevar, which is one of the specialties of Jaipur. I also got some misri mawa packed to have it later. The staff at the restaurant, wearing a warm smile, treated me like a friend. How sweet of them! It clearly shows hospitality runs in the blood of Rajasthanis. 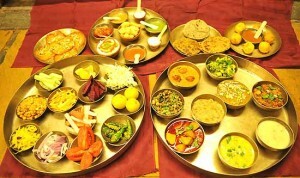 Be it vegetarian dishes or non-vegetarian delicacies, Jaipur’s menu has choices to tempt everyone.